Discussion in 'Edged Tools' started by Girlwhotools, Nov 8, 2018. Picked up these babies at an estate sale today and I gotta say im pretty pumped. Now I've done a little research -- the Falls City is a Kelly Works, correct? Even though there's no extra stamp saying so? And the Plumb as far as I can tell is a rafting pattern? When I first saw it I thought it was a cedar pattern, but now I'm seeing some differences. It does seem like people confuse the rafting, the cedar, and the victory pretty often. I was just hoping for a little clarification. Beach Hiker, Bobsdock, woodsmanjohn and 8 others like this. Nice ones. The Plumb's a National. Plumb Victory wasn't a pattern, but rather a stamp they used all across the board during ww2 and on from there a while. Not positive the dates but I'm sure they're easy to find. Land, Michael OD, Beach Hiker and 5 others like this. thank you @Muleman77! (I knew I was mixing up victory and national. Silly me.) So what are the differences between the national pattern and a rafting pattern? Muleman77, Bobsdock and Winterhorse like this. Nice finds. That Plumb should clean up to be quite a nice piece. I too think it's a National pattern. Quite similar to a cedar pattern. Muleman77, Bobsdock, Winterhorse and 1 other person like this. The Rafting Axe has a hardened poll. Kelly made Falls City. blind & lost, Girlwhotools, Muleman77 and 3 others like this. Loving that Plumb! I am curious how much the Falls City weighs in at? It looks pretty big, I have not come across that before. Picked up these babies at an estate sale today and I gotta say im pretty pumped. The Plumb as far as I can tell is a rafting pattern? 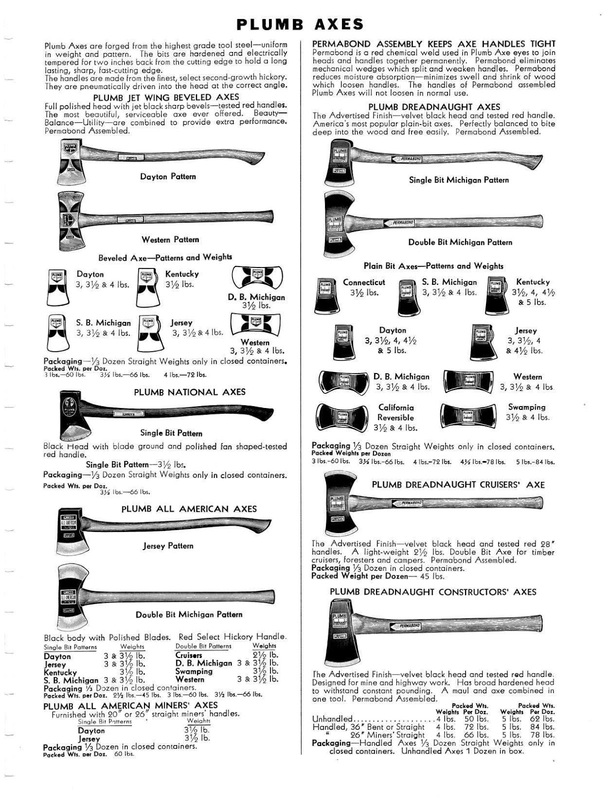 I just bought a Plumb Victory hatchet with a National pattern head a few weeks back and ago. Did you get the hatchet or the axe? I really like the lines on that Falls City! I'd in the 1.5 - 2lb range. Haven't put it on a scale yet, but will let you know when I do! I'm fairly certain it's a hewing hatchet as it's only ground on one side, but I've never come across one with a bevel around a nail puller like this... throws me for a loop in a good way! I've seen plenty roofing and shingeling hatchets, but never one like this. And it's ground only on one side like a hewing hatchet so... I don't know! I guess more research is in store! It's a national hatchet, no victory stamp. But gosh, do I love the lines. And how the poll's corners are cut. It's a great looking hatchet in my book! Same here! I've never seen one like it! Can't wait to see it all shined up. Your Falls City is a flooring hatchet. Falls City was an intermediate grade for True Temper with a grade bellow and above it. That being said I doubt it will leave you wanting in any way. I use a Plumb flooring hatchet quite a bit on a carving stump as I like the size and single bevel. They also have hardened polls. Land and Girlwhotools like this. Falls City is the nickname for Louisville KY where Kelly Works was for a while in the late 1800s. Not sure that yours hatchet is that old but that's where the name came from. Girlwhotools and garry3 like this. Thanks so much @garry3 this is exactly what I was hoping to find out by posting on this forum. I really appreciate the information!